I should make it very clear at the outset that this is not a review of this book, nor is it a post where someone looking for any sort of revelations about Judge Holden, the Kid, or what McCarthy's saying here will discover anything at all. Instead, it's about two and a half moleskine notebooks (large size) being filled with close-reading notes, with observations, vocabulary, googled references to Shakespeare, the Bible and other sources, lightbulb moments, a bazillion questions, and pink and blue highlighting over the course of a couple of weeks. It's about getting stuck in a world that is difficult to leave, even when you've left it. It's about getting one chapter shy of the end and wondering if I can take any more that day because I was just too depressed to move on. It's just that kind of book. And I loved it. page 44: 13% -- "Loving every slow second of this book." page 84: 24% -- "I don't remember the last time I read something this intense. Going slow to get the most from it." -- In truth I was really barely crawling through this book, making very s-l-o-w progress. On the home front, Larry was actually here that day (not traveling), and I told an online friend I planned to read all day if he didn't need me. In my head, it was a pretty safe bet that he wouldn't -- as I said to her, "he's pretty busy with writing a speech for work so hopefully that will corral him for a while." Not four hours later I wrote her that "he's out of his corral. There may be "Evening Redness in the East" if I keep having to listen to his speech after every addition." 12/01: -- I noted "Super progress today - this book gets darker and darker, but better and better with every chapter." -- In the real world, I had read up to page 124. Then at around 4:00 that day, since I'd just been sitting there reading the entire time, Larry comes downstairs and says, "do you know you're wearing the same clothes you had on yesterday? The pants are inside out." I was absolutely horrified but then I just started laughing. He looks at the table where I'm sitting and I could almost read his mind. There was the coffee cup I'd used that morning, still half full; my half-eaten lunch quesadilla still on a plate on the placemat to the right, a bunched-up paper napkin with dried-up tangerine peels on top of it just sitting there, and the Neilsen tv diaries (most days marked "no viewing") I was supposed to have mailed 2 days earlier. Oh well. Nothing I can do about that now. Actually he made me feel like one of those world of warcraft addicts that sits in front of a computer screen all day, and I didn't blame him at all. I just took a shower and changed my clothes. 12/02: -- Page 152, and "Oops. I got so wrapped up I forgot it was my turn to cook today." Holy crap. How does someone forget to make dinner? Blame it on the book. I was really wrapped up in the novel that day and did not want to stop. Larry came downstairs took a look at the once-again world-of-warcraft station (the breakfast room table) and says "where are we eating tonight?" In my house that's a serious question because where we live you have pretty much no choices - eating at a decent place requires a minimum 20-minute drive. I was in no condition to leave the house. I had my hair in a scrunchie on the top of my head with strands leaking out every which way; I was wearing a pair of comfy yoga pants that Larry keeps telling me to throw away because the elastic has been pretty much dead for a year and at that point, the thought of going upstairs to put on any kind of makeup and real clothes was just too much work. We used to go to the neighborhood Italian for pizza when we were desperate, but they closed because the manager's such a cow and had huge staff turnover. There's another smaller little pizza place that smells like cheese the minute you walk in and they don't deliver so you have to go in and face the cheese smell if you want to eat, so that's out. Then there's one nearby Chinese restaurant where you have to be pretty desperate to eat since they give you yesterday's grey, stringy pork in today's pork fried rice and their eggroll drips with so much grease that you take one look at the paper it's wrapped in and just want to puke -- so that was out too. I'm getting desperate because he's hungry and I'm feeling guilty, so we call the one place left where you won't die if you eat the food. Next day I had to give up reading to atone and made homemade pasta. 12/04: -- by now I've read to page 232, and my status update said: "109 pages until the end. My brain hurts." Well, evidently my brain wasn't even functioning at that time, because there are 351 pages in my book so I was off by like 10 pages. I wasn't joking though. My brain really did hurt. By now I also started feeling like the South Park kids in that episode where they're all playing world of warcraft and can't leave their computers so they get really fat (of course, while I'm reading this intently, my regular exercise has become a freakin' chore I just don't want to do). I'm also neglecting things again. Larry came down at one point during the day and asked me when the dogs had gone out last and I swear I couldn't remember. I'd looked in on the group at the end of the day to see how everyone was progressing, and the discussion about what the letters branded on one of the character's face meant had come to a close. My friend in the group says something along the lines of "well, we can all sleep soundly knowing that we've answered a few questions today," and I figured that she's so right -- not because I was thinking about questions answered, but because I was just exhausted from spending my days so focused on reading this novel. I mean, this is NOT the easiest book to read because it's pretty philosophical and you absolutely must pay attention to language use in this novel, and on top of that, it's emotionally draining to get through scenes of scalping, wanton violence and murder, etc. "I'm giving the book a pass today. I didn't sleep soundly -- I was dreaming of being in Texas in the desert and seeing St. Elmo's fire, so I think I need to walk away for a day." It was true. Instead of a horse, though, I was in a car and on the side of the car was a huge red white and blue logo in the shape of the state of Texas and as I was being driven through, all kinds of horrible stuff was going on all around. "I can't remember a book that has so gotten under my skin that it reproduces itself in nightmares. And it wasn't even the violence -- I've been thinking about it all morning and it was more my ongoing idea as I've been reading that the landscape in this book reminds me of hell. I'm not religious at all, but dreaming of being in hell is never a good thing. " Let's just say that I've read books that were so creepy that I couldn't get to sleep -- but this nightmare thing was new. The weekend comes along now, and so I actually need to spend time with my spousal unit who has to leave Monday for a week, so I read a little but not until Sunday. That night I had to go to a neighborhood Christmas party and that day I realized just how far I'd let myself go being stuck in this book for so long -- I went to the grocery store and bought Nestle's pre-made refrigerator cookies, stuck them all on 2 baking sheets and threw them in the oven. That was my contribution. I love to cook, but I had absolutely zero energy ... I just wanted to read. I went for an hour or so -- thankfully they put desserts in the back room so I didn't have to claim ownership. The store-bought cookies remained anonymous. 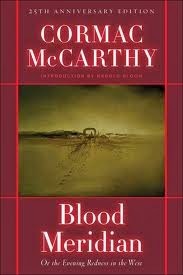 So - at the same party, someone asked me what I was reading and I opened my mouth to say Blood Meridian but I was afraid she would ask me what it was about and I didn't want to go there. My coffee pot died this morning. My faithful workhorse grind-and-brew Capresso coffee maker just quit working after seven years, so now I'm down to the pod machine. That is not real coffee by any stretch of the imagination. The day started out poorly. I made a note about it on Facebook because my friends and family know that coffee for me is the elixir of life. Yes. A first-world problem, but still. I need coffee when I read. I shouldn't have spent the entire day reading with no one here to give me a reality check. Larry left in the morning, but not before telling me that a guy from A-1 leak detection is coming on Thursday to take a look at our pool to see if he can find and fix the leak, and that I needed to fill it on Wednesday. I knew deep down that I would totally forget and the guy would show up so I actually had to write down on the calendar for Wednesday that I needed to fill the pool and at what time. Otherwise, and I swear this is true -- he would have shown up Thursday probably to a completely empty swimming pool. Also, to prove that I could actually get away from the book and do what needed doing around here, I threw a load of laundry in the washing machine. It was still there when I went to bed that night. Ah, but that was the day when I started the dreaded chapter 22, which was so disheartening I had trouble sleeping that night. Laundry getting moldy in my washing machine was nothing in comparison. I forgot to eat today. "Today chapter XXII damn near did me in. I have to say, this book is so incredibly outstanding - but probably the most emotionally pulverizing." I wake up and remember after wondering where the hell's my coffee maker that it no longer exists. I walk to the pod machine (it's in this little niche where there used to be a wonderful huge pantry, but no, the former owners of this house decided to make it a stupid and useless butler's pantry) and open the coffee pod drawer and it's filled with Larry's latte pods, some decaf espresso and then paydirt -- "real" espresso so I fix that. Gross. I can't take the coffee situation any longer so I decide to do something about it. . Like getting takeout, that's easier said than done where I live. The only place to buy a coffee maker without driving 20 minutes is the local grocery store. Have you ever seen the selection of coffee makers at your local grocery store? I hadn't either. My choice was Mr. Coffee 4-cup brew or the 12-cup model. So I decide on the 12-cup and put it in the basket. Taking it out of the cart to put it up onto the checkout counter thingie I twisted my back somehow and it was all I could do to get home and throw on a heat wrap so I can make it through the day. I was supposed to go to lunch with my friends but now I'm sort of stuck at home. So instead of feeling really awful about missing lunch, I think "oh cool. I can finish the book today!" which is terrible, because the purpose of the lunch was to help cheer up a woman whose very young son had just passed away. "Can we read like "Rebecca of Sunnybrook Farm" or its equal next?" By the end of the day I only have 4 pages to go ... but I can't take any more so I have to stop reading. Up at 4:30 a.m. and enjoying my coffee, although I must say that Starbucks Rwanda Rift Valley is less than perfect through a Mr. Coffee machine. I look over at the table (which once again, now that Larry's not here. looks like the good old world of warcraft station) and the book is beckoning. I can't do it. I haven't had enough coffee yet to get through the horrors of those last four pages. Later I go out and turn on the hose to fill the pool, setting the timer on the microwave so that I won't forget to turn off the water in my reading haze because I would have. I finally have enough guts to get started on the book and I finish the last chapter. Then I puzzle through the epilogue, filling more pages in my notebook, and adding even more questions I want to bring to the group. I must say, I would have done a happy dance after having finished it but a) it's not that kind of book and b) if you've read it, the words "happy" and "dance" just don't sit well together, especially in the last chapter. I'm glad it's over, but now I'm sort of feeling like I'm suffering from book-related PTSD. I can't explain it any better than that. The killer part is that reading it was the easy part -- now I have to go through and put things together in my head and relive it all over again. But it's well worth it. It turned out to be the epitome of book excellence.